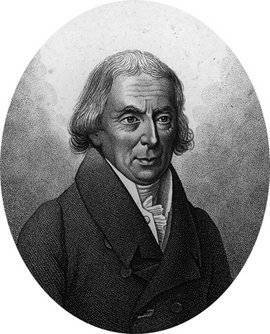 French botanist, born at Tremblay on the 14th of February 1750. After graduating in medicine at Paris, he was elected a member of the Academy of Sciences in 1783. In the same year he set out for North Africa, on a scientific exploring expedition, and on his return two years afterwards brought with him a large collection of plants, animals, etc., comprising, it is said, 1600 species of plants, of which about 300 were described for the first time. In 1786 he was nominated to the post of professor at the Jardin des Plantes, vacated in his favor by his friend, L. G. Lemonnier. His great work, Flora Atlantica sive historia piantarum quae in Atlante, agro Tunetano et Algeriensi crescunt,was published in 2 vols. 4to in 1798, and he produced in 1804 a Tableau de lécole botanique du muséum d'histoire naturelle de Paris, of which a third edition appeared in 1831, under the new title Catalogus plantarum horti regii Parisiensis. He was also the author of many memoirs on vegetable anatomy and physiology, descriptions of new genera and species, etc., one of the most important being a "Memoir on the Organization of the Monocotyledons." He died at Paris on the 16th of November 1833. His Barbary collection was bequeathed to the Muséum d'Histoire Naturelle, and his general collection passed into the hands of the English botanist, Philip Barker Webb.